In the coming week I’m off to Denmark to see several exhibitions, and review a few of them. I will go to Louisiana at Sjælland (Zealand) (a favorite museum of mine) to see Peter Doig. There is also a Jeff Wall exhibition on show (the same exhibition I saw in Amsterdam a year ago). And an exhibition of David Hockney‘s work on paper. Louisiana is a museum with lots of space – indoors as well as a great sculpture garden. Its a perfect place to spend a day. 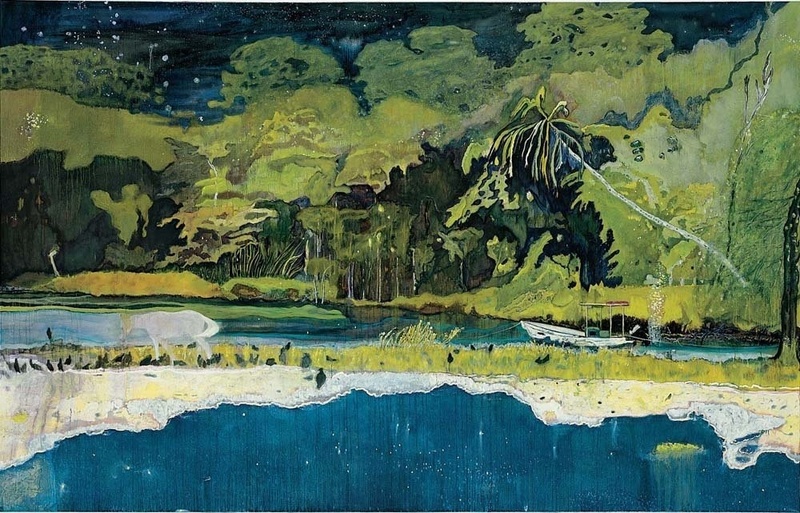 “Grand Riviere” is Doig’s first painting of Trinidad, where he lived as a child before moving to Canada and then to London, England, where this painting was created in his studio. Doig often combine landscapes and scenes from different parts of the world in one and the same painting. In this lush tropical scene, we can also see references to Canadian landscape painting, a clear influence throughout Doig’s career. From Sjælland I will take a train to the smaller island Fyn, where my plan is to visit Brandts’ summer exhibition called SELFIE. It sounds like a dream trip! That’s very exciting! Art and travel go well together.